Towing & Heavy Cargo Transportation | Business Activities | FUKADA SALVAGE & MARINE WORKS CO., LTD. 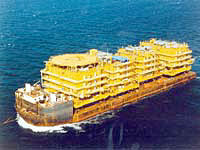 Heavy cargo and irregular items are transported via barges on the ocean when they cannot be transported via aircraft or vehicle. Since ancient times, these and other commercial practices have uniquely developed through the special environment provided by oceans. Safety and assurance are keywords for marine transport, which bears a large inherent risk. We have a long track record using large barges for marine transport, of course between domestic ports, but also between Japan and other countries as well as for trade between third countries. With our semi-submersible barges, which are special float on/off barges that do not require heavy equipment to load/unload cargo, we can help ship plants and work vessels to regions with underdeveloped infrastructure, such as those with no piers or cargo handling equipment. We plan maritime shipping using diversified methods to match our customers' multifaceted needs, and put our various working vessels to use to get your products to their destination.